StageBio is a leading provider of GLP-compliant research and preclinical histology, pathology and specimen archiving services for the biopharmaceutical, medical device and contract research industries. Formed through the merger of Histo-Scientific Research Laboratories (HSRL) and Vet Path Services, Inc. (VPS), StageBio represents the combined capabilities of two of the most well-respected sources of high-quality histology and histopathology services in the preclinical research and development market. StageBio’s integrated offering includes tissue analysis, efficacy determination for new compounds and devices, toxicological evaluation of products subject to regulatory approval, detailed pathology reporting for GLP studies, medical device pathology and immunohistochemistry. The company operates three state-of-the-art sites in the US, with substantial continued investment in facility and technology infrastructure to meet the growing demand for high-quality histopathology services. We have more than 19 board-certified veterinary pathologists and over 50 laboratory technicians on staff supporting our unified commitment to quality, scientific integrity and client satisfaction. At StageBio, quality is inherent to our culture. 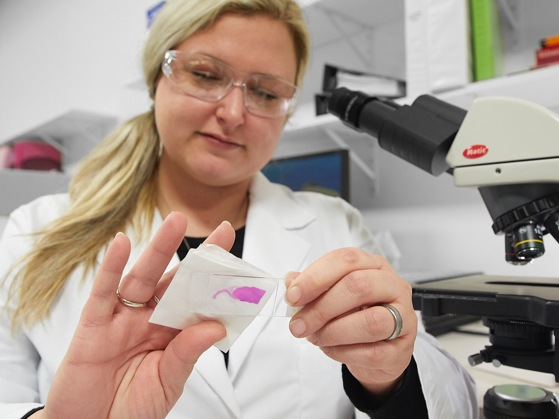 From the preparation of your histological slides to the data that informs your research, we adhere to the highest standards of quality and compliance, laying the foundation for your development success. We support both regulated and non-regulated studies of all types and sizes. The majority of studies supported by StageBio require compliance with US FDA, OECD, EPA, Chinese FDA, and/or JMHW regulations. Our dedication to compliance on a regulatory level has allowed us to achieve an industry-wide reputation for quality. StageBio maintains a dedicated quality control program within a dedicated Quality Assurance Unit (QAU), to ensure the work we perform for your projects meets the highest standards.